Artists have long had a fascination with the sea, and with collecting the flotsam and jetsam that washes up on the shore to incorporate into their art. 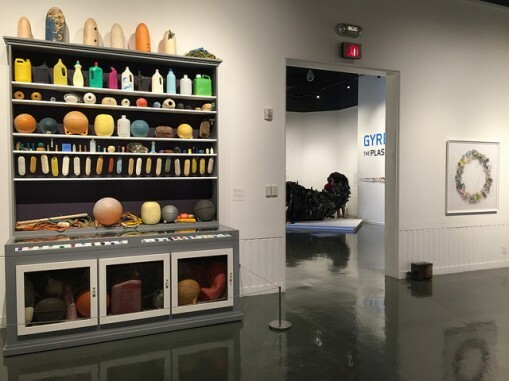 But it’s a rather sinister form of ocean debris that is the focus of a touring exhibition organised by the Anchorage Museum and currently on show at USC Fisher Museum of Art in Los Angeles, USA. 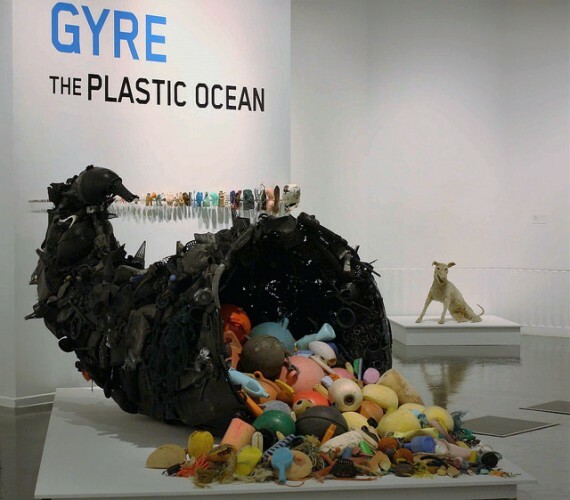 Named in part after the systems of rotating currents that power the oceans, Gyre: The Plastic Ocean includes works by 25 artists, all of which reflect upon and make use of the plastic pollution that finds its way into the marine environment. 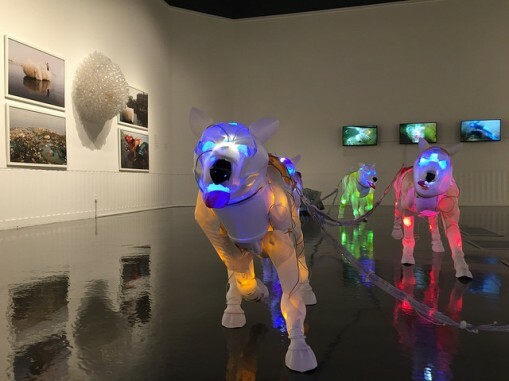 Above: Installation shot at USC Fisher Museum of Art, Los Angeles, USA with Cynthia Minet, Pack Dogs. One such system, the North Pacific Gyre, has gained the nickname the ‘Great Pacific Garbage Patch’ due to the vast concentrations of plastics, chemical sludge and other debris that have been trapped by its currents, with some sources estimating the affected area to be twice the size of the United States. Because of its extremely long life span, plastic is a particular hazard to marine life, eventually breaking down into tiny pieces known as microplastics. These can be mistaken for food by even the smallest sea creatures, as well as by larger animals like seabirds and fish, and ultimately become part of the human food chain. 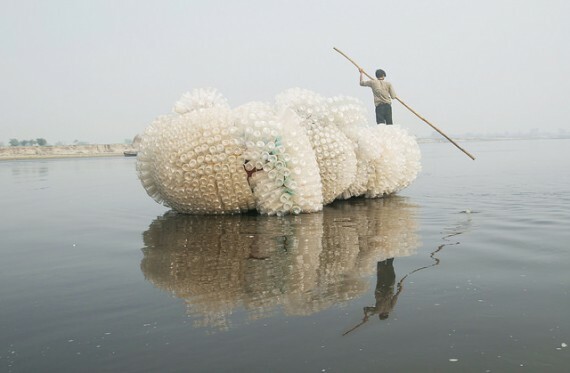 Working with the local NGO in Vrindavan, India, Anne Percoco created a mobile public sculpture out of plastic water bottles. The piece brought to life a local myth about water resources and drew attention to the severely polluted condition of the Yamuna River. Pam Longobardi’s Drifters project addresses the psychological relationship of humans to the natural world. 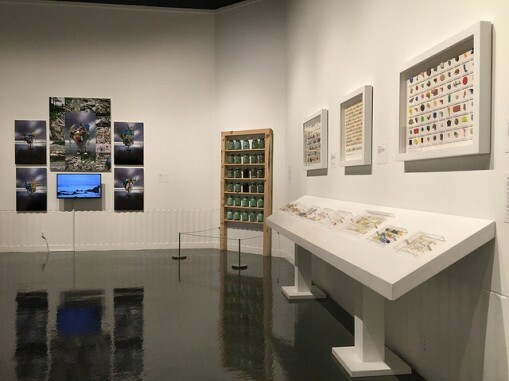 Documenting and transforming oceanic marine debris into works, the artist provides a visual statement about the impact of global consumption on the Earth’s most remote places. Bounty, Pilfered was created from nearly 2500 pieces of ocean plastic removed from beaches in Alaska, Greece, Hawaii, Costa Rica and the Gulf of Mexico. 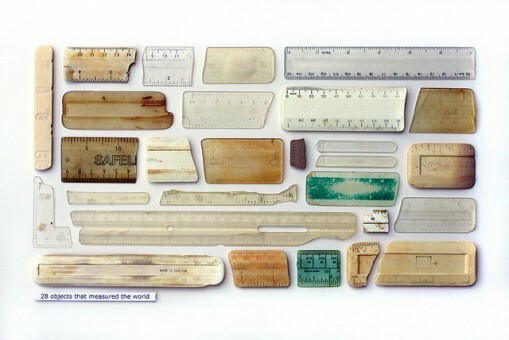 UK-based artist Steve McPherson created this work from rulers and measuring devices found on the shore lines of the north Kent coast in Thanet, where he has been collecting objects for over 15 years. Wave worn, sun bleached and scarred with unknown histories, these finds are collected and collated by type or colour. 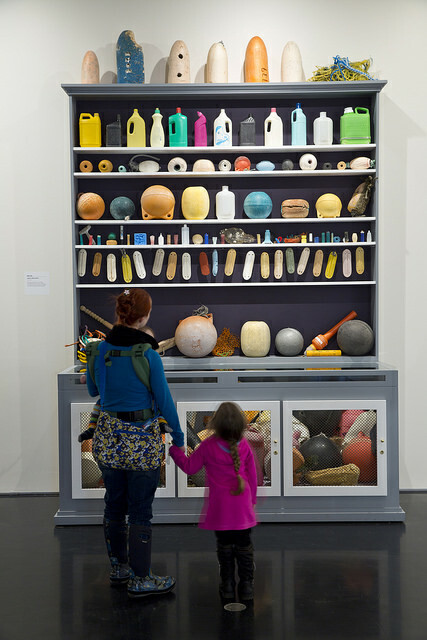 Mark Dion appropriates archaeological and other scientific methods of collecting, ordering and exhibiting objects to create works that question the distinctions between objective (rational) scientific methods and subjective (irrational) influences. His sculptural installations examine the ways in which dominant ideologies and public institutions shape our understanding of history, knowledge, and the natural world. John Dahlsen uses found objects, primarily plastic bags, collected from beaches in Australia to create his wall-based artworks and sculptures. 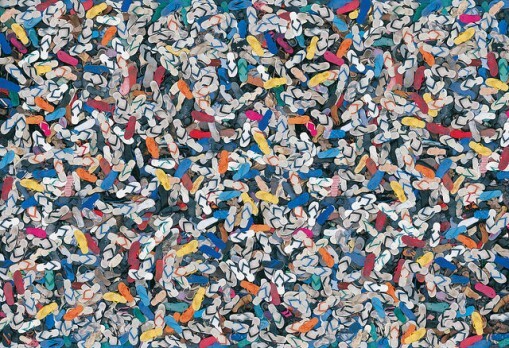 This digital photo presents a bird’s eye view of over 1000 flip-flops he discovered washed up or discarded on remote beaches along the country’s eastern seaboard.